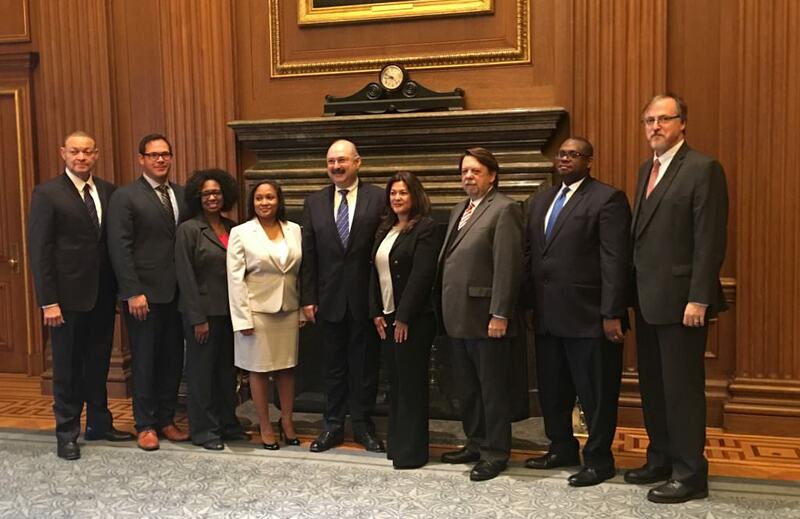 On November 1, a group of eight Seventh-day Adventist attorneys from across the United States were admitted as members to the bar of the United States Supreme Court. The event was organized by the General Conference of Seventh-day Adventists Office of General Counsel. General Counsel, Karnik Doukmetzian sponsored their admission and officially moved the names during the ceremony and Chief Justice John Roberts admitted the attorneys. Those admitted were Harold Cleveland Jr., Allison Dichoso, Theodore Flo, Meredith Jobe, Maria McPhaull, Josue Pierre, Leesa Thomas, Jesus Uriarte. Admission to the bar of the US Supreme Court is significant for a several reasons. It is recognition that these lawyers have achieved the competence and experience to allow them to practice—to argue cases—before the Supreme Court. Rules of the Supreme Court specify that at least one member of any legal team arguing a Supreme Court case must be a member of its bar. In addition to being able to argue cases before the Supreme Court, membership in the Supreme Court bar allows lawyers who are admitted before the court to access limited seating for those wishing to personally attend a Supreme Court hearing. While the general public waits in relatively long lines to be seated as places are available, bar members are seated in a preferred area directly behind the attorneys arguing the case. Members of the Supreme Court Bar are also provided access to the court’s library for research and study. Following the November 1 ceremony, the Adventist attorneys were able remain in the courtroom to hear a case being argued that morning before the full Supreme Court. The day also included a lite breakfast and lecture about the Court and its history. “The event was a great opportunity for Adventist attorneys from across the U.S. to connect with one another while sharing in a milestone together in being admitted as members of the legal fraternity of the highest court in the land,” concluded Doukmetzian. For more information about upcoming events for, and other information about, Adventist lawyers, please visit adventistlawyer.com.